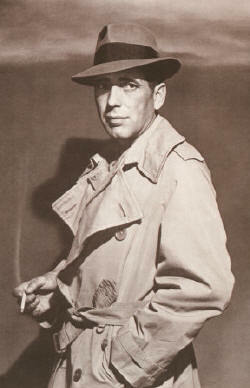 NOTE: At the writing of these articles, Bogey's was still located at the Hotel Defuniak. We are now located at 660 Baldwin Avenue. Hours: Breakfast, Tues.-Sat., 7-10 a.m.; Lunch, Tues.-Fri., 11 a.m.-2 p.m.; Dinner, Tues.-Sat. at 5 p.m.
Bogey's Restaurant is part of the historic Hotel DeFuniak in equally historic DeFuniak Springs. The hotel, worth an article itself, is a throwback to the old fashioned, small-sized and privately owned establishments that offered guests breakfast, lunch and dinner, all in the same building, without the need to search out the town for places to eat. I have eaten lunch at Bogey's several times over the years—I work just around the corner—but this was my first dinner. Breakfast and lunch are also served, and the restaurant has a full bar. We ate at Bogey's on a rainy weeknight, and I was encouraged to see that the dining room was well attended when we arrived. It's a single room, with a small lounge area near the bar for those just there for drinks or an appetizer. Bogey's has a handwritten list of early-bird specials, and some specially priced starters that probably vary daily. The dining room is intimate, with tables nicely spaced for conversation without too much fear of eavesdropping. Carved wooden chairs, table linen, and muted lighting provide an adult-romantic feel. The walls are decorated with French and Italian liqueur ads from the early 20th century, as well as movie posters (several of Bogart films, naturally) and black-and-whites of Sinatra, Louis Armstrong and Miles Davis. Miles actually looks like he's not angry, a rare shot. The menu offers appetizers, salads, fish and seafood entrees, and house specialties. The style varies from Asian/Caribbean fusion to Italian to American/Continental. It's a fairly wide variety. When's the last time you saw veal scaloppini on the same page as fish and chips? It's possible to satisfy pretty much any taste from this menu. Service, in the person of Theresa, was friendly and attentive, never rushed. We started with Bahamian shrimp skewers and crab-stuffed mushroom caps. Six good-sized shrimp, plump and butterflied, came on a bed of shredded lettuce, dressed with a honey/garlic/soy dressing. They went fast. The mushrooms were lighter than I was expecting (a good thing), and the crab stuffing emphasized crab over stuffing. Six (maybe more) piping hot mushrooms yielded about two bites each, with a buttery béarnaise sauce. It was one of the best versions I've tasted of this sometimes-heavy dish. Other starters are crab cake, soft-shelled crab, baked Brie, spinach and artichoke dip, and oysters Rockefeller. There are also salads that can serve as a main course: Montego Bay (with fried fish), Caesar, grilled or blackened shrimp salad, and a house salad. Prime rib was a special feature that night—I think it may be a weekly thing—so my dining companion went for it. I chose soft-shelled crab, which I hadn't had in about a year. The beef was slightly rarer than the medium my friend had ordered, but she finished it all up. On the side were mixed vegetables, and we both shared a basket (two actually) of hot-from-the-oven bread, crusty and garlicky. Two soft-shelled crab arrived (many places serve only one), sautéed and hunkered down in a pool of beurre blanc. I got the mixed vegetables, but baked potato is also available as a side, and there was a special that night of asparagus. I ate all there was, and let the bread pick up the rest. I did not taste soft-shelled crab until I was nearly 30, and I've been making up for lost time since then. Two-soft-shelled crab for $16.95 is a bargain. Other main course choices are New York strip, filet mignon, chicken marsala, several veal selections, shrimp scampi, stuffed shrimp, catch of the day, and fried shrimp. The catch of the day (farm-raised tilapia that day) comes prepared with a number of sauces - piccata, almondine, Lorenzo, and Normandie. The nightly specials also include some fish variations. We decided to split one dessert, though many were offered. Of tiramisu, "ice cream" versions of key lime pie and bananas Foster, a crème brulee cheesecake, chocolate bombe, and a bourbon pecan pie, with chose the latter, served warm with vanilla ice cream. I ate most of it, the prime rib having satisfied my friend until lunch the following day. The pie was the thick kind, just warm enough not to melt the ice cream right away. The server recited desserts, so I expect they change from night to night. Lest you think DeFuniak Springs is nothing but an outpost of fast food joints and country buffets (it has both), drive into the center of town, to the fancy little hotel across the street from the police station, and slip into Bogey's. You can get one of a number of thoughtfully prepared items from an impressive variety of styles and won't bankrupt yourself in the process. Copyright © The Beachcomber, Inc. 2003 - 2008. All rights reserved. DEFUNIAK SPRINGS — If you haven’t eaten at Hotel DeFuniak recently, it’s time to go back. With a change in ownership of the hotel, the restaurant has been transformed. Bogey’s Bar & Restaurant is casual, but offers white tablecloth dining in a comfortable and attractive dining room. 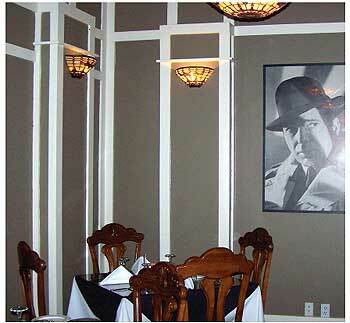 Dark walls are decorated with old photos of celebrities. Chairs are substantial and comfortable. Bogey’s has an understated but elegant feel that fits its historic location. Service was outstanding. We were greeted warmly, and our server didn’t miss a beat, remembering fine details and constantly checking back with us (without being intrusive). Good service helped make our meal enjoyable, but the star of the show was chef/owner Brad Harding’s food. Classic cuisine influenced by Harding’s experience in the Florida Keys are combined to create a menu that goes from casual to elegant without overreaching. The menu is seafood intense. Catch of the Day starts with a sautéed filet of the fish of the day in a wine and lemon butter sauce, and then offers one of four toppings. A favorite at our table was the Normandie (mushrooms, tomatoes, shallots, hearts of palm, almonds and crab meat). Picatta is classic with capers and lemon, while Lorenzo, topped with blue crab stuffing and Bearnaise is rich. Seafood goes more casual with Crunchy Catch of the Day. It is perfect with panko bread crumbs providing a lovely golden crust around a moist interior. Crunchy fried shrimp are another good casual option, and respectable Fish and Chips are also on the menu. We also enjoyed seafood in appetizers of a jumbo crab cake and a sautéed soft shell crab. The cake was large enough to be an entrée if paired with a salad. It was filled with crab, and got richness and flavor from a subtle Bearnaise sauce. 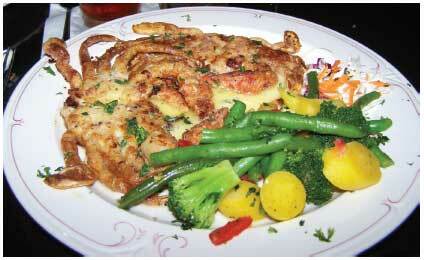 The soft shell was nicely crisp and was accented with a garlic and wine sauce. Other starters include baked brie, spinach and artichoke dip, and grilled shrimp glazed with honey, garlic and soy sauce. While seafood is abundant on the menu, there are plenty of non-seafood items that are just as delicious. Filet mignon au poivre is a good option, as is veal or chicken picatta. Veal Restaurateur was a nice choice. Breaded veal was topped with ham, tomato slices and provolone. The dish was brought together with a brown demi-glaze. Dinner can be a light affair with an entrée salad. One option is the Montego Bay Salad topped with fried grouper tossed in a delicious honey-garlic-cilantro dressing. Salads are also offered on the lunch menu, which is decidedly more casual than the dinner menu. Starters include excellent fried green tomatoes and hot wings that make good use of the honey-garlic-cilantro dressing. Sandwiches make up the majority of the menu. Cold sandwiches include chicken and tuna salads. Burgers are offered plain or dressed up with toppings including caramelized onions and Swiss cheese. The hot sandwiches include the irresistibly good Crunchy Key Largo Fish Sandwich with a crisp grouper filet fried with a panko crust. The chicken melt with caramelized onions and bacon on sourdough is another good hot sandwich. Desserts are offered at Bogey’s with house-made selections being the best. We enjoyed a Key lime pie, and a crème brulee cheesecake. Desserts are displayed in a case in the coffee shop area of the hotel (where the main dining room used to be). The coffee shop is open during the day except for Sunday. Bogey’s is a wonderful addition to DeFuniak Springs. With excellent food and service, and outstanding value Bogey’s is likely to become a popular destination even for those who don’t live in DeFuniak Springs. Lunch: Tues-Fri from 11 a.m. to 2 p.m.
Dinner: Tues-Sat starting at 5pm. Colleen Coffield Sachs is restaurant reviewer for the Daily News. She dines unannounced at area restaurants for this column. You may write to her in care of the newspaper at P.O. Box 2949, Fort Walton Beach, FL 32549.